The Colour 5k: Lessons learned. Yesterday , I did my first colour run – not technically The Colour Run (that’s a few weeks off) but a Colour 5k – one of an alternative set of such occasions that are starting round the country this year. I was very excited – I’d been wanting to do one of these for ages and, even though the atmosphere wasn’t quite the full on whoop party I was expecting, I was still fun. You always know a race is going to be fun when the person in the car next to you gets out wearing a tutu. I feel running something in a tutu may be my next ambition. Anyway I digress, for those who haven’t done a colour run the idea is simple, you run 5k and every 1k people throw powder at you. On the face of it this sounds like simple, clean/messy fun, but read the Runner’s World twitter feed and you get a whole other story – bronchitis from the dust, ruined cameras, all sorts of scariness. I admit I turned up with trepidation (and one of the facemasks I bought in Japan just in case). Thankfully it all seemed to go okay and, despite having asthma, I can breathe just fine today. There are however a few potentially helpful tips I did pick up which might help anyone running one of these things in the future. 1) Wear things you don’t care about. 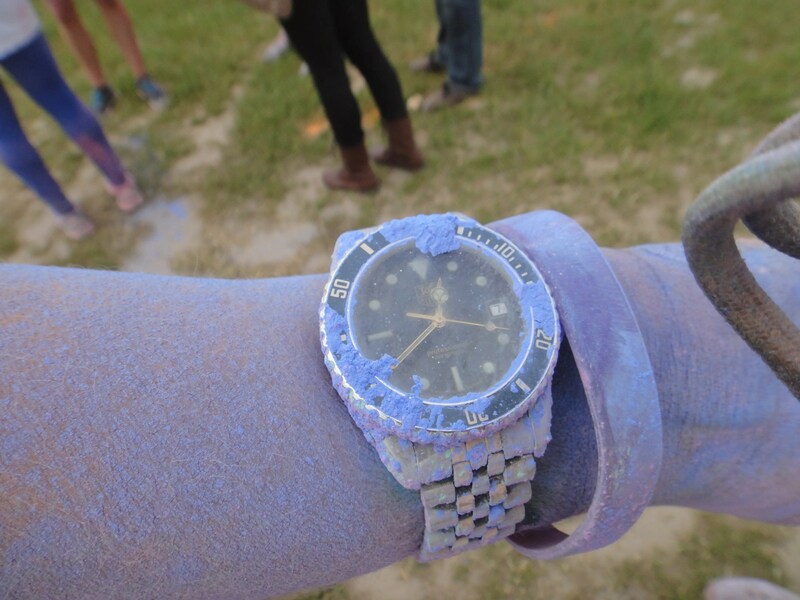 The powder gets everywhere and while it’s supposed to wash out, don’t risk wearing anything you don’t mind getting covered – and that includes trainers and watches – I forgot about mine. Thankfully it’s waterproof so I could just stick it under the tap but if yours isn’t it might never get clean. 2) Wear sunglasses: I hadn’t actually thought about this until someone I know in Sydney said the powder dyed her contact lenses. Whether you wear lenses or not, it does get everywhere and dusty stuff in your eyes is not going to make for a happy run. 3) Bag your camera/iphone. There are reports of people mucking up professional cameras at these events as the dust gets in the lens and whirry bits. I took an old camera in a ziploc bag which didn’t work well. For the next one I’ll cling film everything but the lens – although to be honest, I got rubbish photos going through the colour zones anyway – so maybe just wait until afterwards. 4) Don’t expect excellent race conditions. This might not hold true for every event, but let’s face it, if you had an immaculate sports field or track would you want people throwing cornstarch all over it? The course for the race I did had stones and gravel and ankle high grass which made it pretty miserable to run. 5) It’s a race lots of beginners will want to do. Don’t get me wrong, I’m not a running snob by any stretch of the imagination but people were walking after 0.5km. Now this isn’t a problem, anything that gets anyone moving in any way shape or form is good in my book, but I am a slow runner – 30 mins for a 5km – so I headed to the back of the pack where I normally sit. This wasn’t the best idea as the course was super narrow and the first lap was a nightmare of tripping over people. In the end I had to sprint up the side for a bit – which wasn’t ideal with the long grass. If you do regularly run 5km you might want to head a little further forward than you normal to avoid race rage. 6) Make sure the hot water is on at home – or pack a flannel and water in your gear bag if you need to clean off at the event. It took at least a 10 minute shower to get it all off and required a flannel – and it’s still not totally out of my hair. I’m really not sure how the tube is going to cope post the Wembley Colour Run – we put binbags on the seat of the car so we could drive home, but who knows what’s going to happen post London – as…..
7) Do not expect a gear tent. This didn’t matter for the race I just did as we drove there, but I’ve checked with the London Colour Run organisers and, as it stood at the date of their reply there is nowhere to stash your kit – this means if you want to get changed afterwards you’re going to have to carry a bag. A bag that’s going to get covered in dust and that may not be washing machine friendly. I’m still not quite sure how to deal with this one at London as I have to bring kit as I’m running the British 10km first, plus I’ve got a 2 hour journey back home – may need to invest in a cheap plastic drawstring bag and choose my lightest outfit. 8) Check your ears….The Boyfriend still has a bit of green powder in one of his. I’m waiting for an appropriate moment to tell him….. 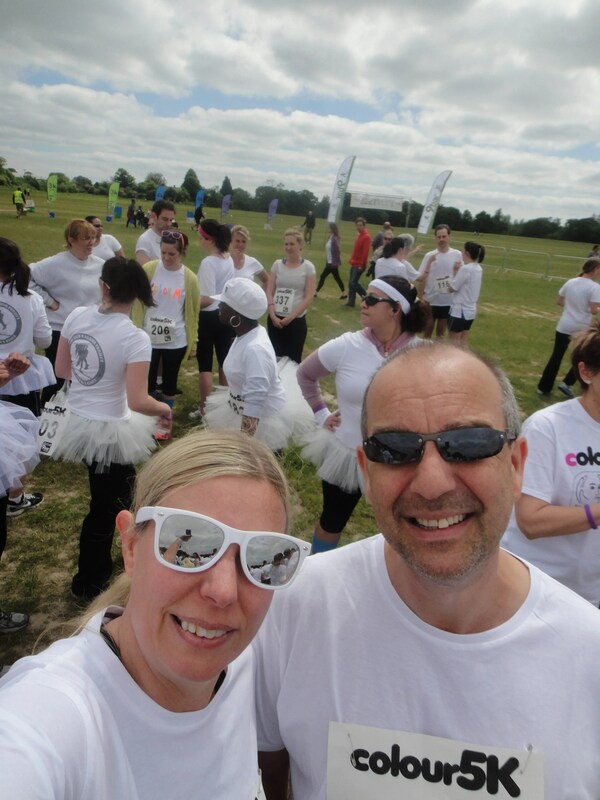 So, Colour Runners – anyone got any other helpful tips or tricks? There’s a space below if you want to use it…….. Brilliant looks great fun and love the tips especially the contact lenses one would never have thought. Right must look for Belfast but most would end up in my gob from talking or puffing!